Due to some technical difficulties with our church computer, we were unable to record this past Sunday’s message from Pastor Gabe on James 4:13-17. We highly encourage you to read that passage this next week and reach out to others at the church is you can discuss it with them, or join one of our community groups as we go through the passage from Sunday together! 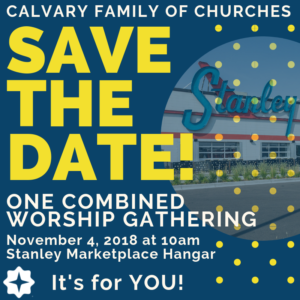 Also, next week is our combined worship service with the other members of the Calvary Family of Churches (see more at this link)! We would LOVE if you would join us for this awesome worship service! The service will be held at the Stanley Marketplace Hangar (located at 2501 Dallas St #135, Aurora, CO 80010). Service will start at 10:00 am. It is located about 30 minutes away from Calvary Summitview, so plan accordingly! It will be so worth it to worship together as a family of churches! Reach out to Aaron (aaron@thecalvary.org) if you have any questions!